I was thinking about something interesting to make for Easter and my mind said “is there such a thing as Carrot Cake Biscotti”? So I figured, why not give that a try! I started making biscotti a couple of years ago and I have to say that I love it (and my 15-year-old son is crazy for it)! In my opinion, making biscotti is so easy, easier than cooking endless trays of traditional cookies. You make the dough, form 2 loaves, pop them into the oven, pull them out, slice them and bake them some more and then you have tons of beautiful biscotti…In this case Carrot Cake Biscotti. I took the flavors that are in a carrot cake (like brown sugar, raisins, carrots, and pecans) and plopped them in my biscotti base. They came out perfectly! I made one batch with nuts and one without. I tinkered with a cream cheese/white chocolate drizzle and yucko!! So I tossed that. What I ended up with was some drizzled with melted white chocolate and some drizzled with a traditional glaze. I enjoyed them unadorned straight from the oven…I ate all 4 end pieces lol! These are perfect for your Easter dessert table or as a hostess gift packaged in a pretty tin or cookie jar or any time of the year! If you need a fun treat for the kiddos…my kids love making AND eating these Egg Shaped Marshmallow Treats. Crafts you can eat are SO fun!! In addition to my Carrot Cake Biscotti, I got together with some of my local blogging friends and we came up with 25 Easter Recipes we think anyone will enjoy! 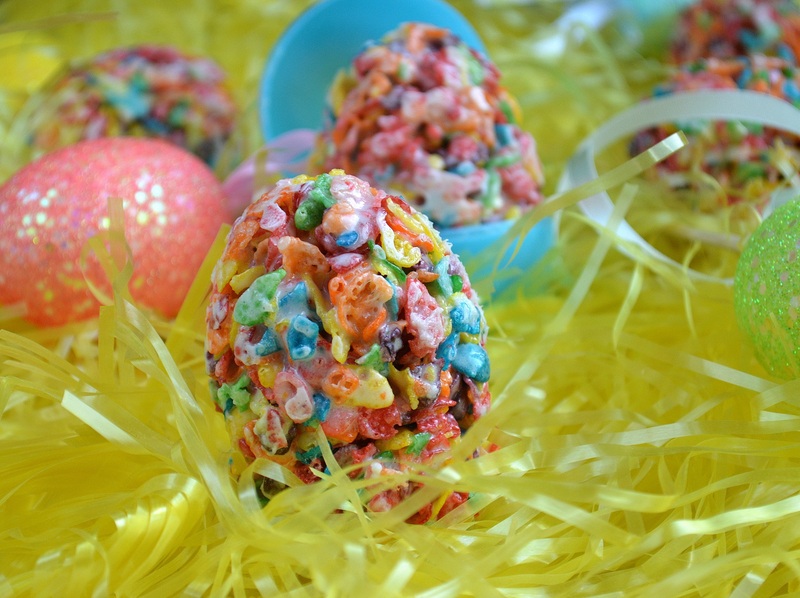 So have fun looking over our “Ultimate Easter” Ideas, hopefully you find something to try! 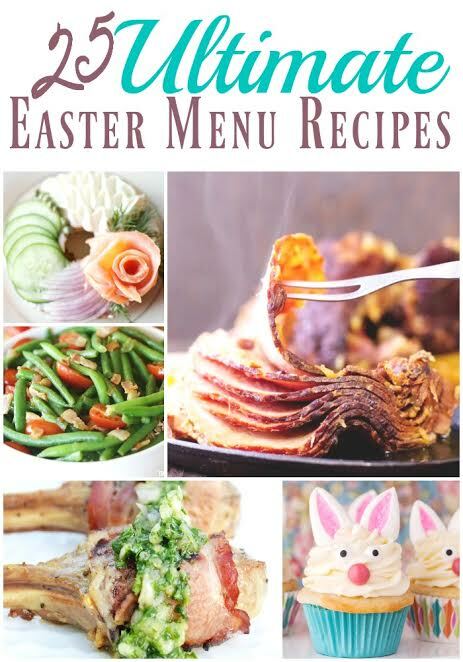 I also have an “All Things Easter” Pinterest Board with tons of Easter recipes, crafts, decorating tips and more! Melt white chocolate and drizzle over OR make a simple glaze with 1 cup powdered sugar, 1 tsp vanilla, 2 TBS milk. Mix well until smooth and creamy. In your food process or, pulse carrots and raisins until chopped very small (almost a mince). *If you have not found minced pecans, add the pecans in as well. Add in butter, sugars and eggs and pulse until combined. In a separate bowl, combine flour, baking powder, cinnamon, nutmeg, and salt. Scrape the carrot mixture into the flour mixture and mix until fully incorporated. The batter will be a bit sticky, that's fine. If its still wet (you never know about the water content of carrots) feel free to add more flour. Working on a floured piece of parchment paper or pastry board, shape each half into a long roll shape, about 12-14" long. Carefully lift rolls onto a baking sheet, 3-4 inches apart from each other (or once dough is firm, shape them on your parchment lined baking sheet. With your fingers, press down on each “log” so that they end up being about a ½" high. When biscotti had cooled enough to handle (3 minutes), yet are still warm, use a sharp knife and cut crosswise slices (approximately ½" in size). You can cut them right on your baking sheet (if you cook 1 log at a time...If not you may need to carefully lift one log at a time to a cutting board and cut. Lower oven temp to 325 degrees. Once cut, flip each piece to one side (cut side down) and place back on original baking sheet. Bake at 325 for 10 minutes. Remove from oven and quickly flip slices over to the other side (i just use my fingers). Bake for another 10 minutes or until somewhat firm and lightly browned. Glazing: Space biscotti pieces no more than ½ inch or so apart from each other on either a wire rack or parchment paper (hello easy clean-up) dip a metal whisk into glaze or melted white chocolate,quickly drizzle back and forth, back and forth across sections of your Biscotti Continue until they are glazed to your liking. 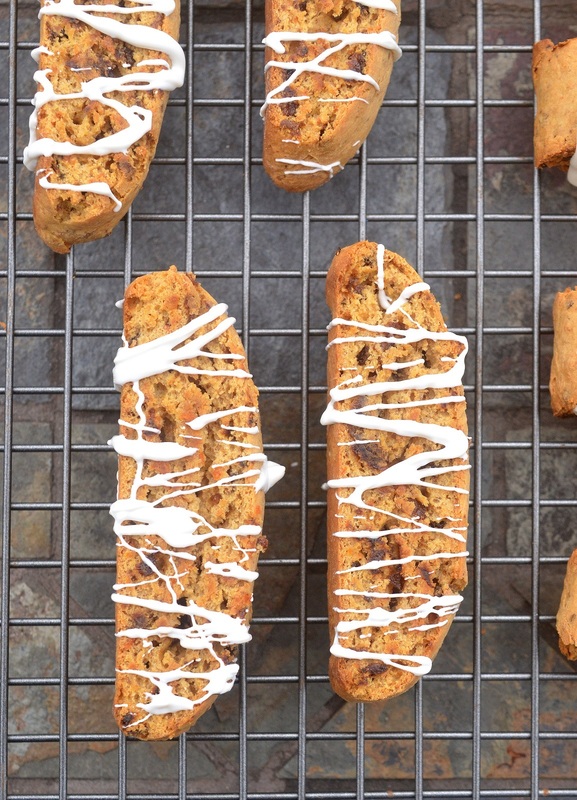 For crispier biscotti, leave the sliced pieces in the oven another 5 minutes per side. You can use your food processor to mince the carrots, raisins and nuts or you can chop by hand (they also sell pecans minced). What a deliciously amazing idea! I love carrot cake! Are you kidding me? 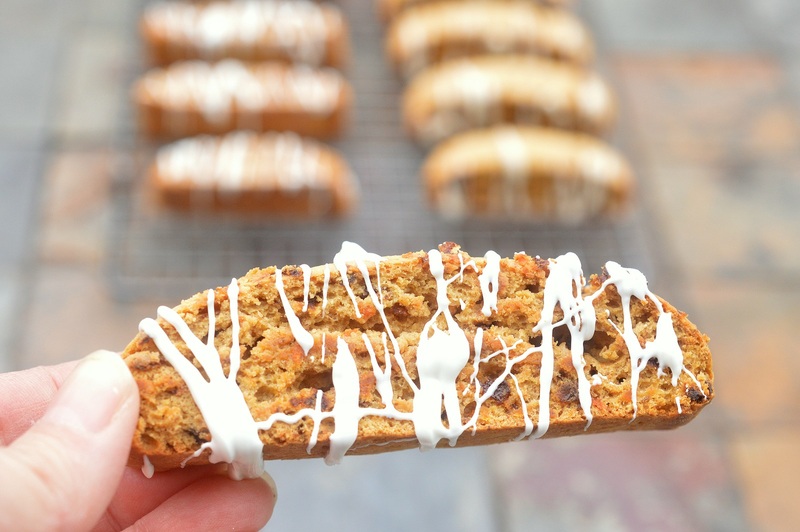 These combine my 2 favorite things: carrot cake and biscotti! I want one! Don’t have good processor. Will blender work?